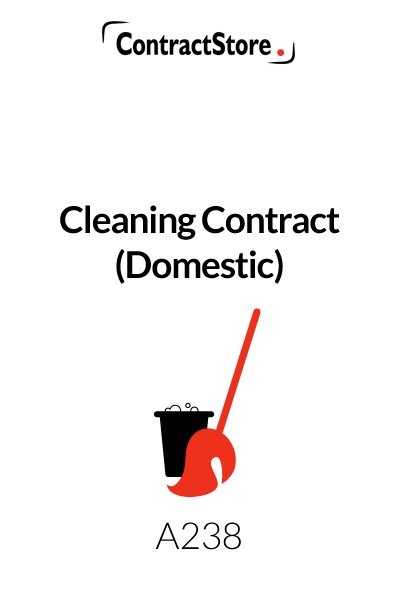 Who can use this Cleaning Contract? 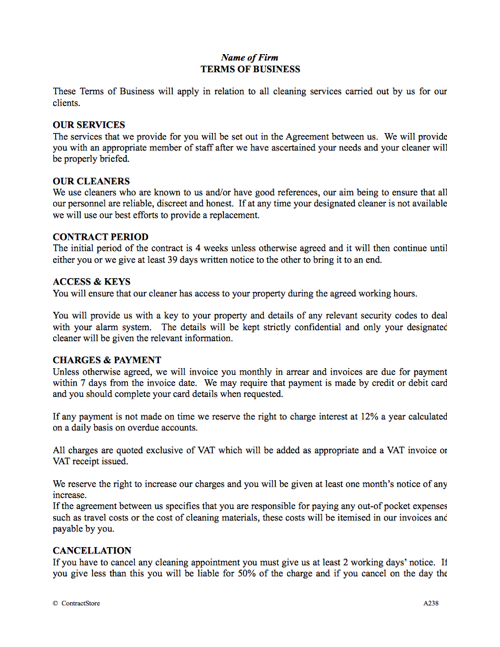 Anyone who provides cleaning services, in particular for private houses, can use this cleaning contract. 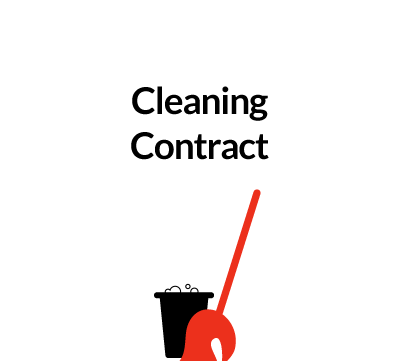 What is this Cleaning Contract for? This package of documents includes a one page user-friendly Letter Agreement, Terms of Business (in a one page format as well as in more traditional style) and a Schedule for the details of client, rates, timing etc. to be completed. Staff. Make it clear that staff have been vetted, and are experienced. The firm is likely to want a clause prohibiting the client engaging staff directly. Timing and Cancellation. The firm may require a cancellation charge if adequate notice isn’t given to cancel a booked appointment. For a company that provides cleaning to offices and industrial premises, we recommend our document A196. This refers to the services which are identified in detail in a schedule and makes it clear that a designated cleaner will be provided to the client. This is designed to reassure clients of the careful vetting of staff by the firm and deals with a replacement cleaner if the designated one is not available. Unless otherwise agreed the initial period is 4 weeks and it will then continue until 30 days notice is given by the firm or the client. The client will give access at the agreed times and provide a key and details of alarm codes on a confidential basis. The fees are set out in the agreement, and this paragraph sets out the standard payment terms, with the client being liable for interest on late payment. Credit or debit card is referred to as this may be the preferred payment method. If the client wants to cancel a booking without giving adequate notice, the charges will be due. Cleaning staff are not expected to work on public holidays unless agreed. Any good cleaning company needs to make it clear to clients that standards will be maintained and any slipshod work dealt with and this paragraph is designed to deal with this. The standard notice period is 30 days, but non-payment or breach of contract by the client entitles the firm to terminate the contract at any time. This is intended to stop the client from offering the firm’s cleaners a job during the contract and for 6 months after it finishes. There is compensation payable by the client for breach of this clause by the client. The firm is not liable if unforeseen circumstances (“force majeure”) prevent it from providing the services. The firm accepts liability for damage caused to the client’s property but on the basis that the cost will be recovered from its public liability insurance. It is always sensible for a firm to limit liability. Our wording is intended to avoid claims for indirect losses as well as limit overall liability to the client to a maximum amount, which is likely to be related to the fees payable. No sensible service provider earning a few hundred pounds a month wants to risk a claim for several thousand pounds if something goes wrong. Legal advice is recommended here as if the wording is too restrictive it might be treated by a court as being unfair, when the client is a consumer and not a business. But reasonable limits are likely to be effective. This specifies English law and English courts resolve any dispute but there is also an option for settlement through negotiation and mediation.